It’s a valid question and one I struggle with as well. My wife and I run our own business, have three growing kids, a house to upkeep and many other things that keep us more than busy. You’re likely in a similar situation and think there’s no time to earn extra money. I used to think that way too, but as with many other things in life, efficiency is key. 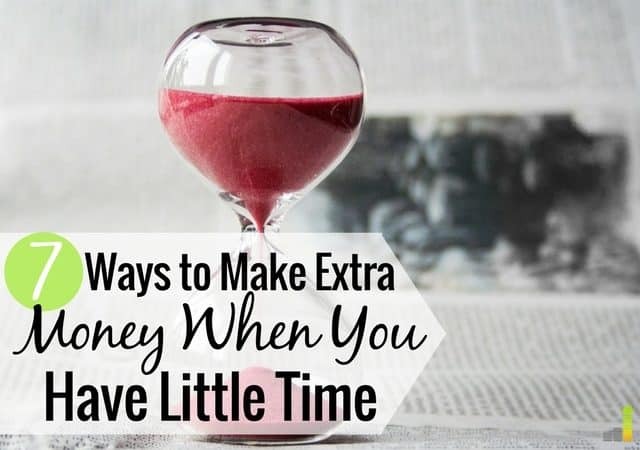 Here are some ways I’ve found time to make extra money. Before I look at finding the time to make extra money, let’s first touch on the power of extra money. Extra money can come in a variety of forms, from working overtime at your day job to picking up a second job to starting a side hustle. A side hustle is the better of the latter two options as your income is limitless and it can be on your schedule. That aside, extra income is great because it can help you reach goals that your normal day job may not allow you accomplish. I believe that most anyone can find a few spare hours in their week to earn extra income – if you want it. Additionally, if you don’t believe you have the skills to make extra money, please don’t give into that lie. In fact, here’s a list of 50+ ways to make extra money – most of them require little, to no skill. If you’re a warm body and the time, you can most definitely find a way on the list to bring in at least several hundred dollars per month or more. The most obvious, and simplest way to find time to make extra money is killing the TV. You may be thinking that TV time can’t really amount to that much. If you’re an “average” person, I hate to burst your bubble. According to The New York Times, the average adult watches just over five hours of television – per day. That’s just crazy stupid. At best it’s dead time, and at worst it’s time you can’t get back. There are many other things to do besides watching TV, making extra money being one of the best. If you’re near the average, you don’t need to give up watching television altogether, simply shave an hour or two off per day and you’ll be amazed how much time you will have to bring in additional income. Ok, so don’t want to get rid of your TV but still want to find a way to make extra money? The solution is quite simple; busy yourself while watching TV. Think of it as monetizing your dead time, so it’s not a complete loss. There are many ways you can make money while watching TV. Taking surveys is one possible option. You need to be realistic about this possible option, it won’t make you rich, but if you use some of the best survey sites, there’s no reason why you can’t make several hundred dollars per month. Are your mornings and afternoons spent in a long commute on a bus or train? If you spend significant time on either, this is a great source of time to work on your side hustle that can directly or indirectly impact your extra income potential. You can use that time to work on your phone or laptop, or simply use it as time to think over ideas. My commute was always by car, but if you spend hours each week getting to work, and it’s not by car you have plenty of time to make extra money. Taking your lunch to work is a great way to save money. You can save hundreds per month by simply bringing food from home. However, if you have extra time during your lunch break, you can also use it to make money. I know many have used it as time to take surveys, work on their online store, write and more. Just make sure you’re not putting yourself in trouble with your day job by working on your side hustle while in the office. The last thing you want to do is put your job at risk. I think one of the best ways to make extra money is by doing something you already enjoy doing. You avoid the learning curve involved with learning something new, and it allows you to profit from your hobby. We have a family friend that has used her love of taking pictures to grow her own photography business. At first, she just charged enough to get better cameras and now has a profitable business. There are many ways to do this and make extra money. If you love to write, you can start a blog and use it as a portfolio to get more clients. If you like to take pictures, you can sell pictures online. If you like meeting new people, you can drive for Lyft. The possibilities to make extra money are endless. Working on your side hustle can be a challenge if you have a full-time job or a growing family. You want to fill your limited time with things important to you, not to mention something you enjoy. When I first started side hustles, I would often block off one hour in the day to work on different projects. I’m not a morning person, so I would block off an hour at night and use it to work on my side hustle and make extra money. I found that it helped me stay focused and have increased efficiency. You may find that you can’t give up an hour every day, but every other day. Start with that until you find other ways to tweak your schedule. Multitasking can be great, except when it’s not. How many times have you tried doing multiple things at once only to notice you don’t get as much done and thus your multitasking is counterproductive? When you wisely use multitasking, it can be a great way to maximize your time and earning potential. One good example is when you’re waiting for your child to finish practice. Another is if you wait on hold a lot. Either of those can be used as time to make extra money; you just have to find those opportunities and use them to your advantage. Making extra money can be a powerful way to increase the possibility of reaching your goals. I like to see it as mental accounting. I tie a specific money earning activity to a specific goal. Doing so challenges me to work harder to reach my goal and encourages me when I may want to let up. You also want to keep in mind that you only have so much time in a day. Yes, you want to use it efficiently, but you also want to make sure you allow time just to be yourself and with your family. Making extra money is great, but you also want to take time to smell the roses and enjoy life. 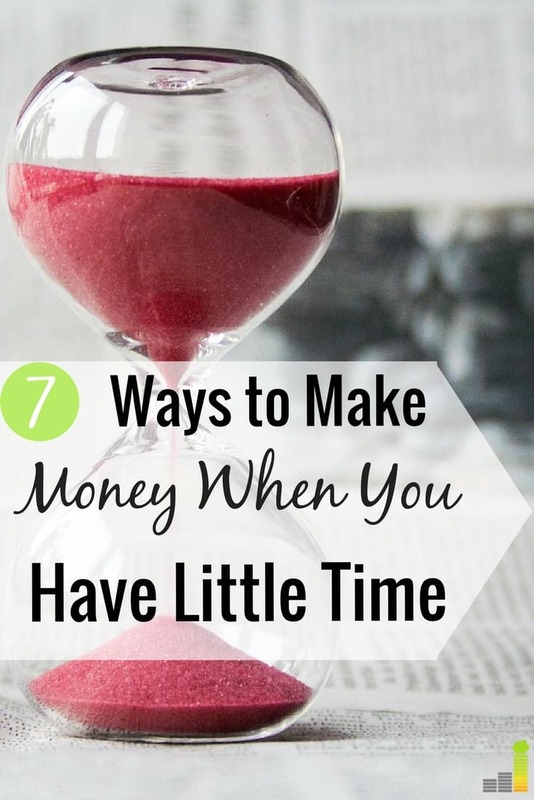 What are some other ways you find time to make extra money? Do you use mental accounting to assign side hustles to specific goals? What’s one area that challenges you in finding time to earn extra money? Thanks BMG! Lol, I know what you mean. For some people taking lunch off for side hustling simply isn’t possible, but if you do have the opportunity it can be a really, really great way to side hustle. I typically work through lunch but when I do have time to work on my side hustle taking 45 minutes to an hour to work on a blog post can be HUGE from a productivity standpoint. Good point DC. I had a job like that in the past and doing outside stuff really wasn’t a possibility. However, if you can, it can be a great use of your time – like you said.